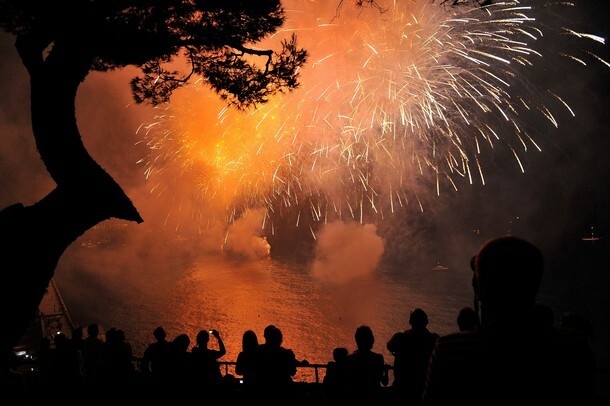 Hello-Hello, welcome back to the ‘real world,’ it truly feels like summer now, the fireworks and celebration of freedom yesterday make it seem more seasonal. Today’s post might be considered ‘old news,’ and many readers may have already read about it, so do accept our apology if it is somewhat stale information! Of course, we are talking about this weekend’s wedding in Monaco. Festivities really began with an Eagles concert last Thursday night, below we see Prince Albert II and Charlene with the band. 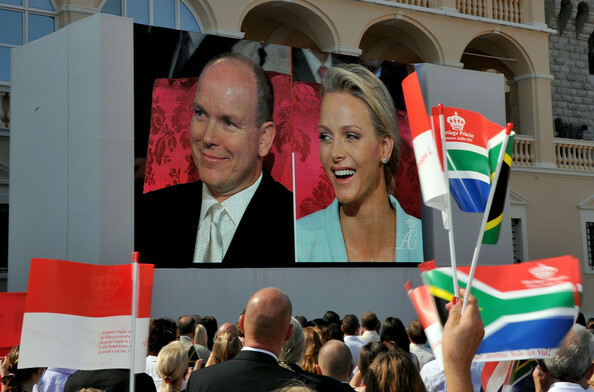 As a refresher for those not quite as obsessed not entirely up to speed on how things work, there were two ceremonies for the former Charlene Wittstock and Prince Albert, the first was Friday’s civil ceremony, below we see the couple at that event. The bride wore a powder blue pantsuit she is said to have co-designed with Karl Lagerfeld, the Grand Pooh-bah of Chanel. Crowds watched the ceremony on giant screens set up outside the Palace. The religious ceremony was held Saturday and the (now) Princess Charlene was stunning. Here we see her father escorting her in to the courtyard of the Palace in Monaco, where the mass was celebrated. The dress was created by Giorgio Armani, the bride is a longtime customer of the house. Here is another angle better showing the dress and train. Princess Caroline’s daughter, Charlotte Casiraghi, was pretty in pink at the Catholic Mass. We see her again with her Albert’s sisters, Princesses Stephanie and Caroline of Monaco. For the evening’s festivities there was another gorgeous gown for the bride. That night there was a formal dinner, and Princess Charlene changed into another gown, also designed by Armani, with ruffled tiers of sparkling white fabric. The weekend was filled with functions mandating very serious party frocks, and even a tiara or two. Some refer to Princess Caroline’s children as the next generation of royals, here we see Pierre Casiraghi, Charlotte Casiraghi and Andrea Casiraghi on their way into the formal dinner Saturday night. As one might expect, there was royalty everywhere. Below left, Sweden’s Crown Princess Victoria and her husband Prince Daniel, on the right we see Princess Mary of Denmark with Prince Philippe of Belgium. 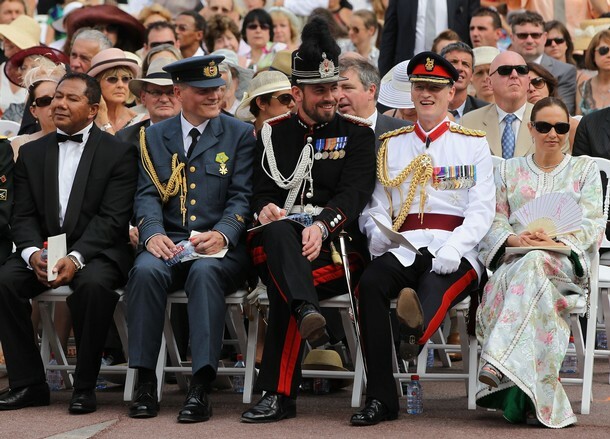 Prince Louis Alphonse of Bourbon and Princess Marie Marguerite are seen on the left, and on the right Prince Laurent of Belgium. Italy’s Prince Carlo of Bourbon-Two Sicilies is shown lower left, on the right we see Thailand’s Princess Sirivannavari Nariratana. Grand Duke Henri of Luxembourg and Grand Duchess Maria-Teresa of Luxembourg are seen lower left, on the right we show Princess Sophia and Prince Alois of Liechtenstein. But perhaps not the kind everyone expected. “But sources cited by the French press on Sunday said the former Charlene Wittstock, 33, had even tried to take refuge in her country’s embassy in Paris in an attempt to get out of the wedding. The story was originally reported last week by a French newspaper and largely ignored by ‘mainstream media’. But “palace confirmation” of some aspects of the story have moved the rumors onto more prominent pages of newspapers, many the kind of publications that don’t generally traffic in such discussion. “The sources said that when Charlene visited Paris in May to try on her white-silk Armani wedding dress she “took refuge” in the South African embassy. Both the bride and the Palace denied the rumors last week. The tears shed by the Princess consort (technically her title) during Saturday’s mass only served to heighten the tone and tenor of the conversation, the internet fed the fire. There are numerous video clips of the bride’s tears making their way around the internet and I watched one. As someone who wept with joy (so much I had difficulty mopping up during the ceremony!) 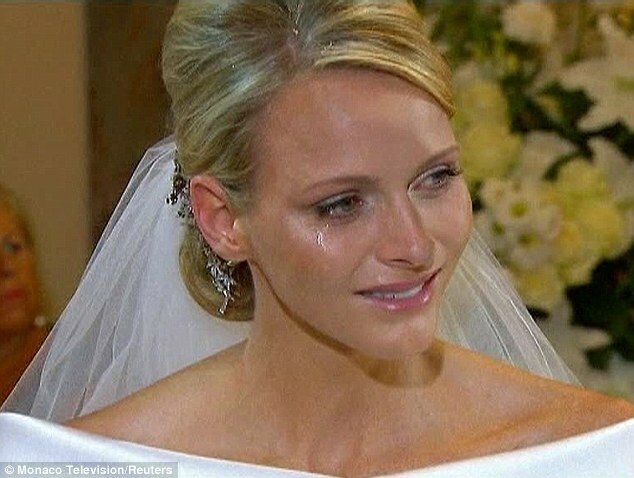 during her wedding, these do not look like happy tears. On the other hand, I don’t know the bride and have no idea if she was filled with joy or sorrow. Either way, she did make a beautiful bride, and it was a lovely wedding; we hope the rumors are found to be false and the marriage is a happy one. Gossip Girls & Guys at Fashion Week, Preppy Nail Polish? It is a grand and glorious day, despite the wild wind outside and prospect of more s-n-o-w. Bleh. But it is warm and bright here in the corner condo at Princess Intergalactic HQ, we are doing all we can to create our own sunshine! While it is always fun to look at the styles being shown at New York Fashion Week, it is even more fun to share a philanthropic story about the goings-on in the city. In conjunction with the opening of his new flagship store on Fifth Avenue, Giorgio Armani donated $1 million to the Fund for Public Schools in New York. That is news that brings a smile to this camper’s face, it is wonderful to see anyone sharing like this. One could almost term the celebrities ubiquitous at the gala celebrating the store’s opening, including one of our favorites, January Jones of Mad Men. Also at the festivities, designer Thom Browne, he of Brooks Brothers Black Fleece fame. Mr. Browne is also known for the length (or lack thereof) of the pants in his men’s suit designs. Mayor Bloomberg and Caroline Kennedy joined Mr. Armani as part of the ceremony marking the designer’s donation to the City’s schools. We mentioned Thom Browne above; it reminds us of the sneakers he designed along with Converse for the fabulous French store, Colette. Other Gossip Girls stars were spotted at varying shows. First, Taylor Momsen at Anna Sui. Also seen, Leighton Meester in attendance at Proenza Schouler. Ms. Meester appears to be sporting a new do, with bangs! 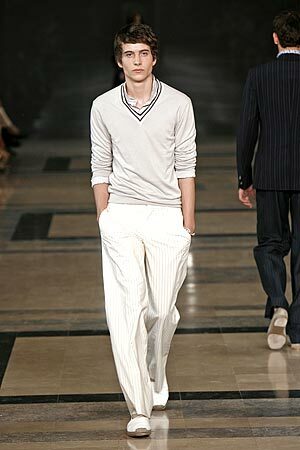 The Tommy Hilfiger show was this morning; we will effort more photos later today, in tomorrow’s post at the latest. This grouping is from a just-published story in the Telegraph. You know that TP is simply ga-ga over the pink coat. Below, four more looks from this morning’s show. We shall have additional photos as promised. 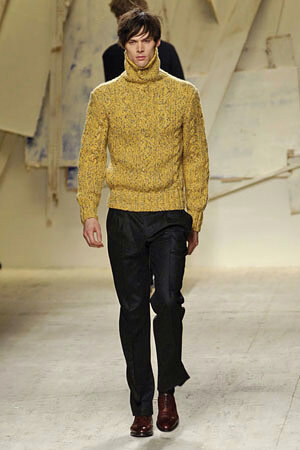 We intend to do the same with another prep-style designer, Tory Burch, who showed her Fall 2009 collection yesterday. The WWD story cautions those fond of a little more tailored or conservative look not to be alarmed by the edgier pieces. Apparently the collection also includes designs more familiar to the Tory Burch customer. Actually, Ms. Burch was in the front row at a show herself, viewing Narciso Rodriguez yesterday. Below, a closer look at Polo Princess, courtesy of the always-ahead-of-the-trend Katee at the E-Polish blog. We simply have to ask: what name do you fancy the most? The always-wonderful Ronda at All the Best shared some insight today about this poster, long a favorite of ours. The message just says it all, don’t you think? We’ll close on that thought dolls, we hope your day is splendid! 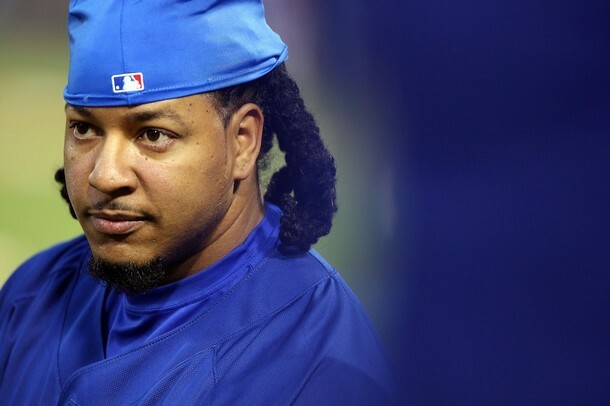 Preppy Manny Ramirez?!? Who are Michael Phelps Favorite Designers? 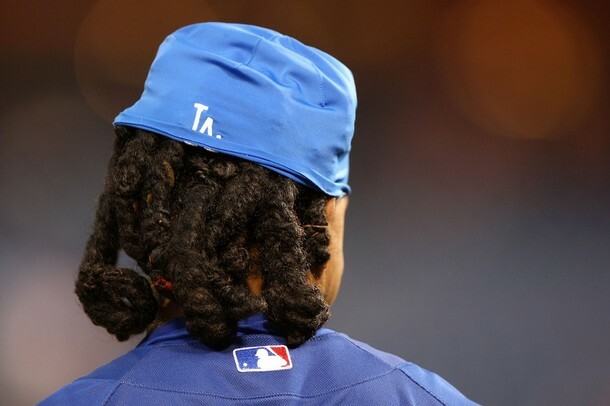 Manny Ramirez? Preppy? Methinks not. This is an extraordinarily gifted athlete best described as a baseball savant, to modify a term in the story. Part of what makes Manny “Manny” is the hair. We’re struggling to remember the last time we saw hair like this on anyone described as “preppy,” although it is actually clear in the story the author doesn’t think he is either. Manny is a lot things, many of them good, some not-so-wonderful, but preppy is not one of them. 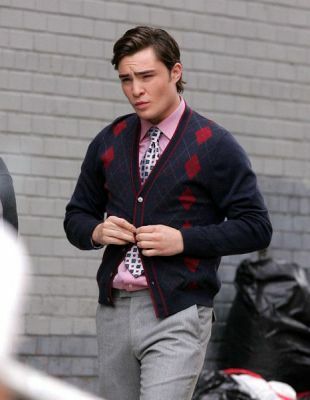 After our recent post all about cardigan sweaters we could hardly omit sharing this one, sported by Gossip Girl star Ed Westwick, otherwise known as Chuck Bass. A friend who struggles with the fact we don’t watch the show is constantly tormenting us with updates and the weekly plot synopsis of the upcoming episode. We have to admit Monday’s show title is really very clever: “New Haven Can Wait.” One of the funnier things in the upcoming episode has to be “Chuck’s” kidnapping, hypothetically carried out by Skull and Bones members while visiting Yale. Honestly. It just all looks a little, well, unnecessary. We didn’t realize she played “Cindy Lou Who” in the “How The Grinch Stole Christmas,” but after thinking about it we definitely see the resemblance. Sadly, we had the same reaction to the dress (nightie?) worn by Blake Lively, who plays Serena van der Woodsen on the über-hot show. 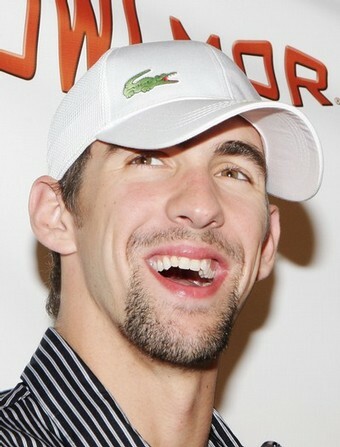 Another silly Sunday tidbit: Michael Phelps has more than one favorite designer. In speaking with the good folks at NY magazine the Olympic star said he considers Giorgio Armani and Diesel. Of course he also includes Lacoste among his first-string, although we have never been able to confirm the fashion house is an official sponsor, as Speedo is. And when asked about going to Fashion Week next time around? One heads-up for anyone still interested in the Phelps Phans tee-shirts we mentioned in a post back in August: they are gone. Apparently the phrenzy is either over or just too much to keep up with, we’re not sure. And with that we say ta-ta for now. On this Father’s Day please take a moment to remember the man who loved you more than any other man ever could. A strange feeling goes through a new father when he holds his child for the first time. He sees time unspool before him. He wants to stop the clock and hold the moment forever. But he knows he can’t and his child will grow up to a life of school, new friends and weddings. Which brings us to today’s topic… black tie. It has always been my contention that black tie optional is an opportunity to look devastating. It all starts with your own tuxedo. Come on, admit it. You should have given up renting a tux when you were seventeen. Owning a tuxedo is a wardrobe necessity and it’s affordable. Plus, classic style never goes out of fashion. Let’s get started with a bespoke tuxedo. Giorgio Armani calls his line of bespoke tuxedos “Handmade-to-measure” and they are exquisite. 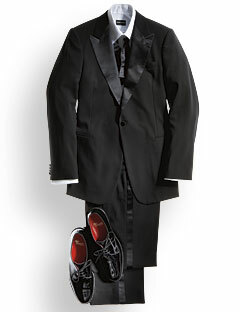 Some things to consider when selecting a bespoke tuxedo: Go with the peak lapels and you won’t be mistaken for the waiter; the mohair is tempting but stick with the wool; a double vent will be more comfortable as the night wears on; so will pleated pants although the plain front always looks trim; single breasted is timeless while double-breasted can appear trendy. How much for all this style? You’ll ante up $4,325 to get into this game. Check with your friends at Needless-Markup if the Armani is your choice. Sounds nice, right? Let’s get this look at a more modest price. Our friends at Jos. A. Bank Clothiers have a number of very affordable tuxedos that won’t devastate your budget (admit it, with gasoline at $4+ it all adds up). The peak lapel jacket is 100% wool with grosgrain lapels. The matching pants have the grosgrain stripe. Normally it’s a steal at $795. Now that it’s on sale for a mere $449 there is no excuse for you to not add this to your closet. Remember, it’s always a good idea to have several tuxedos. You own more than one suit, right? I get my shirts at Charles Trywhitt in London and you should too. Brilliant workmanship and great prices. The Marcella bib front classic collar tuxedo shirt is 100% cotton. Double cuffs are standard and studs are mandatory. Depending upon exchange rates you can expect to spend about $130, although it’s now on sale for just $95. Let’s stay with Trywhitt for our bow tie and cummerbund. Both are black silk and traditional. If you need a reminder of how to tie a bow tie I’ll give you a refresher here. No clip-on ties, please. You don’t want to be the man at the end of the party who, when the other gentlemen loosen their ties, must unclip his. Also, a reminder about the cummerbund: The pleats are worn up. Tradition is that the cummerbunds are worn pleats-up to better catch crumbs during dinner. Expect to pay $60 for tie and $70 for the cummerbund. Of course, you could do all this at Brooks Brothers. But you knew that already. Jewelry is up to you. Stud and cufflink sets are everywhere for every price. I prefer vintage but that’s just me. The traditional guidelines for tastefully wearing jewelry apply. Footware is a source of personal taste. Velvet uppers are elegant but maybe not for you. I prefer the finished look of Allen-Edmonds. 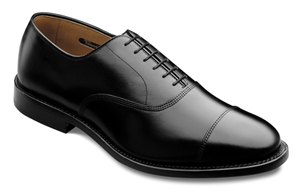 The Park Avenue balmoral is a timeless look with traditional cap toe styling and fit. You cannot go wrong with this shoe, trust me. It’s also extremely affordable at a mere $325. The best part of owning a tuxedo is the options you have. 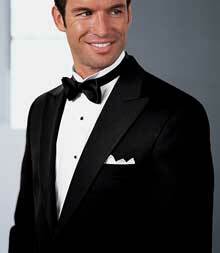 If you are obligated to go to that dreaded party to which we are all invited occasionally, just show up in a tuxedo. The people there will assume you have somewhere more important to be and you can escape gracefully. Thank you all for sharing your weekend with me. It’s been fun and I’ll return the next time The Princess needs a getaway. The Princess is beyond mystified at this juncture by the ups and downs, the little vagaries of the retail world, so without editorial comment here’s what we can report about the varying ‘marriages of commerce’ recently announced. First off, the numbers are in, the data never lie, and the shoe sales at Burberry are more than sizzling, they are on fire. Therefore the luxury retailer plans to expand this segment of their business tenfold, and accomplish that massive task in five years time. The Princess loves capitalism. Really. Above you see the company’s ‘Stud Plate Bootie’ (left) available for pre-order at Nordstrom, and the Burberry ‘Armor Plate’ Buckle Flat (right), also from our good friends at Nordstrom. Those who think The Princess is merciless in her criticism of this firm for their commercialization of the brand should note the second shoe shown above, as it is a style perilously close to “cute,” also something we might actually purchase and wear! Egads! Not to worry. Our keepers will ensure that doesn’t happen. Also Wednesday, word from everyone’s favorite discounter, Target, they have another limited-edition collection on its way, this time from Sami Hayek, brother of Hollywood actress Salma Hayek. The line will feature contemporary furniture, bedding and stationery. Prices will run the gamut, with a low of .99 cents to a high of $149.99 for an office desk. The collection is aimed at college students and according to Le Boutique, it will be done “with minimal packaging that is designed to be reused or recycled, making the items both stylish and practical.” Hayek is quoted as saying the Target collection reflects his “core design beliefs, which include structure, humor and a commitment to sustainable design.” Below you see the Sami Hayek™ for Target® Striped Comforter Set in Brown on the left and the Reversible Coverlet Set in Gray/Tan on the right. The snooze news release goes on to say that “Anyone who values function and practicality housed in great design will gravitate toward Hayek’s product.” Of course; we were thinking just that. When one does a search at the Target site for ‘Sami Hayek,’ 17 results are returned. We do know there are pieces also available for purchase in the stores, we just don’t know how many or what kind of merchandise they are. Have any of our fearless readers spotted any Hayek pieces yet? Anyone with early reviews they can share? As best we can ascertain, this clearly isn’t the Whim line from Cynthia Rowley, but then it’s not intended to be. Some of the pieces appear to have bright colors that pop and reversible fabrics – and you know we like reversibility! And now for some truly significant discourse. I know, I know, you have been very patient these past months and previous 99 posts, wondering if we might ever engage in some kind of meaningful conversation about life, man’s inhumanity to man, that kind of thing. Well, that time has arrived, and to whom do we give our thanks for initiating the dialogue? Eddie Lampert* and his gang of goofballs at Sears. (This is definitely a candidate for the “You Can’t Make This Stuff Up” list.) Evidently LL Cool J is going to save Sears, with a casual clothing line for juniors & young men, girls’ & boys’ that is supposed to hit stores starting this September. The price points will be at the higher end of the spectrum for Sears, $22 for a graphic tee and approximately $50 for a pair of jeans, according to Women’s Wear Daily. What greater topic for meaningful conversation than this? According to WWD “The collection of casualwear for juniors, young men’s, girls’ and boys’ will roll out to 450 of Sears’ 900 stores in September and could generate as much as $100 million to $150 million in its first year, sources said.” A 40-year-old hip-hop star at Sears? I dunno’. Apparently he’s at Macy’s (See reference below) with a different line, and has been for a few months. BTW, we don’t know about the hyphenation of hip-hop, and that is causing us all sorts of aggravation…. guidance from any of our, well, our hipper readers? 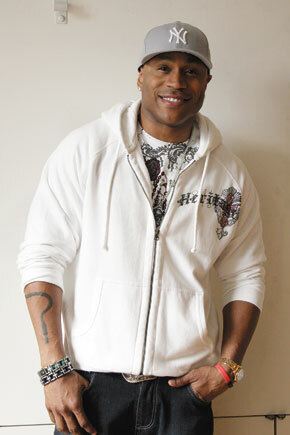 Think of all the other old dullards like TP learning what LL Cool J stands for: Ladies Love Cool James. Oh. Duh. Did everyone but yours truly know that? Huh? I mean, I might have walked into a Sears to learn that fact (doubtful), maybe (not) looked more closely at an ad, perhaps (please call Sister Mary Hand Grenade as this whopper is getting bigger and bigger) watched a TV commercial more closely if I had the time. Or not. Gone into a Sears to return a Lands End purchase gone bad? In a heartbeat. But then, we are not, most assuredly not the demo Sears is after. Not even close. And as mentioned above, we are a raging capitalist at heart, and nothing would be better than to see this little endeavor go great guns. Where the Princess becomes completely confused is this: no one seems to mention in any of today’s coverage that LL Cool Jay just launched another line of clothing this spring, the Todd Smith line! (The star’s real name is Todd Smith.) 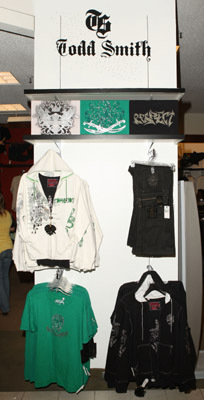 Nor do we see mention of Smith’s 2006 apparel line; this link takes you to a 2006 MSNBC story that makes interesting reading. The photos below are datelined March 8 of this year with a caption reading “LL Cool J Debuts His New Clothing Line ‘Todd Smith’ at Macy’s Department Store,’ so TP is most confused. Why start an additional line, arguably competitive line? We leave this confusion behind for the time being, and move on to the news that Hermes will open its first stand-alone Mens shop in New York sometime this fall. The success of its men’s and women’s apparel lines has been explosive, and added emphasis on menswear has been in the works for some time. The luxury goods seller wants to continue raising its mens ready-to-wear profile; the heavy focus on men’s products at its Financial District Boutique that opened earlier this year is proof of that. Below, a few looks from the Hermes Spring and Fall 2008 RTW Collections. 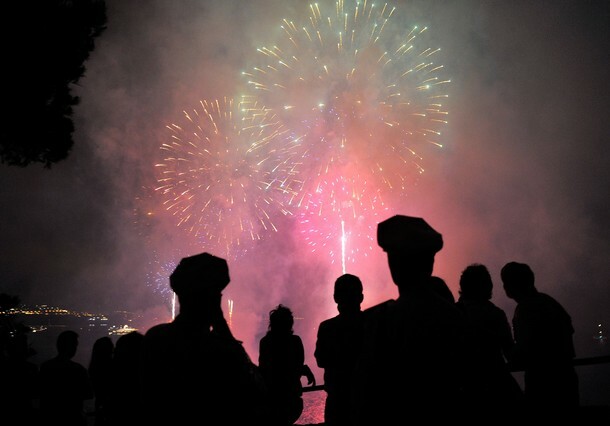 Tomorrow we’ll celebrate our 100th (or 101st, we have to check!) post and chat about the competition Hermes will face from another upscale mens retailer also planning to open a store on Madison Avenue.